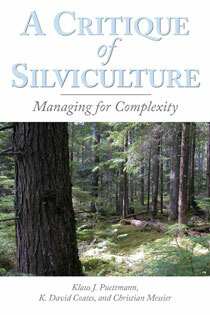 The discipline of silviculture is at a crossroads. Silviculturists are under increasing pressure to develop practices that sustain the full function and dynamics of forested ecosystems and maintain ecosystem diversity and resilience while still providing needed wood products. A Critique of Silviculture offers a penetrating look at the current state of the field and provides suggestions for its future development. A Critique of Silviculture bridges a gap between silviculture and ecology that has long hindered the adoption of new ideas. It breaks the mold of disciplinary thinking by directly linking new ideas and findings in ecology and complexity science to the field of silviculture. This is a critically important book that is essential reading for anyone involved with forest ecology, forestry, silviculture, or the management of forested ecosystems. "In this concise work Puettmann, Coates, and Messier address the issue of complexity in forest management by walking readers through a historical accounting of silviculture as a discipline." "...the authors conduct an excellent review of ecological concepts and the value of those concepts in application to management." -What Do Silviculturists and Ecologists See When They Walk into a Forest? -Who Do Silviculturists and Ecologists Talk to? -What Do Silviculturists and Ecologists Read? -Steps toward Managing Forests as Complex Adaptive Systems: Where to Start?